Thanks again Kaku. I watched these on my laptop (1920x1080) and I must say, I'm extremely impressed with the detail. To my eyes, the footage looks really clean too. I can't wait to have some time to pull these into after effects and see how far I can push this stuff around. Chris, thanks again for taking the time and bandwidth to host Kaku's early clips. We reallly appreciate it. maybe others see this, but I can't. I've pulled in the 60i clips into premiere pro, bumped the gamma high, and can't see any vertical banding (except the rain... :) ). I aso can't see it in the BMP frame grab you posted - which, btw, was scaled down to 1280x768 from a source size of 1440x1080, so not sure whether that may have played a role. can you highlight in the frame grab where you're seeing the vertical banding? I'm really curious about this. I can't seem to get them to work on my computer. What I'm interested in is a comparison between the 1080 60i mode and the 24F mode; if anybody has watched those two and can make a reasoned judgement, let me know. I'm assuming 24F loses a little resolution, but I'd like to know if it's insignificant or what. I coundn't see any banding. maybe others see this, but I can't. I've pulled in the 60i clips into premiere pro, bumped the gamma high, and can't see any vertical banding (except the rain... :) ). I also can't see it in the BMP frame grab you posted - which, btw, was scaled down to 1280x768 from a source size of 1440x1080, so not sure whether that may have played a role. can you highlight in the frame grab where you're seeing the vertical banding? I'm really curious about this. I did scale it down to make the image smaller. As you scale or resample down an image it also softens it a bit so, it becomes overall less sharp. It makes details (such as banding) less noticable. 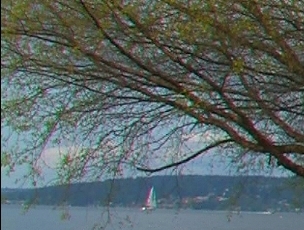 I have highlighted some of the areas such as the top left area where you see a red leaf that is out of focus. If you can't notice alternate darker vertical stripes, then the better I guess. Make sure you look at the image in full screen res, not as a smaller window. I am very sensitive to the matter (just as CA issues) that always kept me away from buying an H1. I am assuming (hoping) these clips from the HX were shot with the gain on high, so under normal lighting these will not show. I am however more worried to see clear CA issues already on some of these first HX clips around some bright water drops and small reflections spots. I fear the problem will be the same as on the H1, which for me, has always been unacceptable. Of course, once we have some outdoor clips available from the HX, we'll then see for sure how that goes. The quality of the optics of the H1 is not on pair with typical Canon products and I have been most surprised with the majority of users not being sensitive to the unsurpassable CA issues on it that make the camera complete unusable to me. Because the lens of the HX series is basically the same (and so are the 3CCDs used) I can only fear the worse, though I am hoping for the best. I am seriously worried about the integrity of the HXs design that, if based on the H1, will again be flawed beyond the limits of acceptability. I am a Canon fan. I love Canon products and like their philosophy on them taking their time before launching a new product to then usually coming up with something top notch. The H1 has never been such a product, though, most get so enlightened by the camera's fabulous resolution that they don't seem to look past that. Just about every shot I see coming from it is basically unbearable to watch and I cannot understand on a 9 grand piece of equipment, how this can be a tolerable issue. This is not a "mild" problem. This a "on-your-face" optical/prism/CCD related matter. Not even sub $1500 HD consumer cameras (like Canon's own new HV10 that I own and am overall most happy with) and sub $500 DV cams show a fraction of the CA issues the H1 has (at least with the 20x lens). Screengrabs from the H1 below. PS - Oh and please, let's not perceive any of these views as "politically correct or that can negatively affect" the sales of the camera. With these informative blogs (I think) we all hope manufacturers take notice on these comments as contructive feedback for them to hopefuly improve their designs and offers. Everything I own (video and Photography) has the name Canon on it and I am proud of it. I only want to keep watching my historial of Canon purchases to grow alongside the great product most of the time, they make. The H1 is NOT one of them and I have been patiently awaiting for a performance step up product from them. I am (really) hoping the A1 is that product. Last edited by Peter Macletis; October 7th, 2006 at 09:44 PM. I don't see the banding either. Most likely because these are not unsurpassable chromatic abberation issues, but rather they are the surpassable shortcomings of chroma sampling schemes of less than 4:2:2. Not surprisingly, some people mistake this for chromatic abberation. For an explanation of what it *really* is, see A.J. deLange's excellent summation here: http://www.dvinfo.net/conf/showpost....2&postcount=44 which includes tips for getting around this issue. In fact this will be one major advantage of the XH (not HX) G1 over the A1... its 4:2:2 SDI output will go a long way toward reducing this particular effect (and I'm not saying there isn't any CA present in the XL H1's stock 20x lens -- there is a slight bit, but no worse than any other HD lens in its price range). What I am saying is that the frame blow-ups posted above are exhibiting the HDV format's inherent chroma undersampling effect, not chromatic abberation. I did scale it down to make the image smaller. As you scale or resample down an image it also softens it a bit so, it becomes overall less sharp. It makes details (such as banding) less noticable. I have highlighted some of the areas such as the top left area where you see a red leaf that is out of focus. If you can't notice alternate darker vertical stripes, then the better I guess. Peter - I think I see what you're talking about, but it was only evident by loading the image into photoshop and blowing it up to 200-300%. I wonder if it's just a side effect of the MPEG compression. it wasn't visible (at least to me) when I watched the clips at 100% or when I went frame-by-frame at 100%. Peter - I couldn't agree more. I understand about this not necessarily being CA, but in the H1 videos I've seen, the high contrast fringing is very evident - distractingly so to me. I'm anxiously awaiting well-lit scenes to judge whether Canon addressed this in the XH, or whether they took the electronics from the XL as-is and the "problem" is still visible. I haven't noticed this issue as much on the Sony side (FX1/Z1 and the new V1), but I wonder whether the lower sensor resolution masks the issue for them. I also haven't noticed it in the HV10 footage I've seen (which has a 1920x1080 sensor that scales to 1440x1080 for writing to tape), so hopefully the fringing is being addressed in the XH. If the XH looks great, I'll keep my pre-order. If the XH looks like the XL, I may reconsider. Looking forward to seeing new footage from Kaku. also, as a test for anyone that has access to a G1, it would be great to see a snippet of footage captured out the SDI port versus written to HDV tape - that would more definitively narrow the source of the issue (and maybe convert A1 orders to G1 orders). 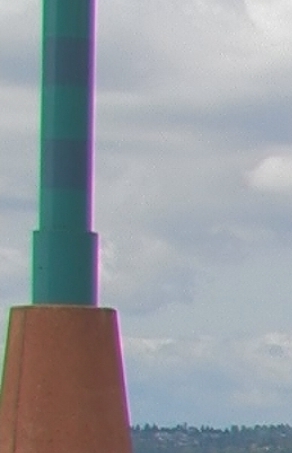 My Z1U will show CA when zoomed in, but it's more of a purple fringing than the red/green characteristic of the Canon. I think the A1/G1 is going to show less of it due to its use of fluorite glass. It was mentioned somewhere else, but did you notice the nice bokeh? Brent, like you, my hopes are high. I have my camera on pre-order with B&H (an A1) and am very excited about the end of the month's hopeful ship date! My (very limited) experience with FX1/Z1 and the new V1, proved me CA issues were not nearly as bad as on the H1. On the HV10 (that I own), CA basically never shows unless in overexposed, backlit or extreme contrasty situations (the HV10 has an absolutely fabulous lens). Kudos Canon! I know of the limitations of the HDV format that Chris (very correctly) pointed out. However, the bottom line is that what happens on the H1 is not an HDV related bottleneck issue but clearly a CCD/ optical design flaw. 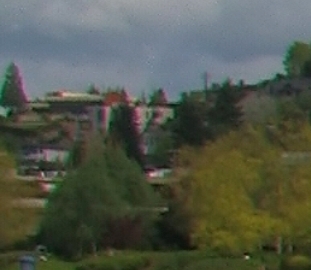 I venture to say its mostly an optical problem as it shows worse on full aperture/full telephoto settings. Canon usually is on the top-of-the-line mark as far as optics and cameras in general are concerned. My old Canon 1014 Electronic Super8 camera still works and has a lens that is a dream (even for today's standards). My mature Canon AE Program 35m/m camera and lenses are as superb as ever. My much beloved 10 year old Canon Optura (that shoots Progressive Scan) is still a Rolls Royce of miniDV cams. My adored XL-1 is still an amazing piece of DV equipment with optics that are outstanding. And of course, my Canon EOS 1Ds-Mk-II and (few) Canon EF/USM Lenses cannot be beat in the world of digital photography. All of the above are spectacular products with stellar optics to match. The XL-H1 is not in the same league. It is a visually disappointing HD camera showing unacceptable levels of chromatic aberrations that are totally distracting from the content no matter how good it is. If some insist those are technically not chromatic aberrations but something else, the fact of the matter is, optically, it looks worse that $300 budget DV cameras you can buy at Costco and CircuitCity. 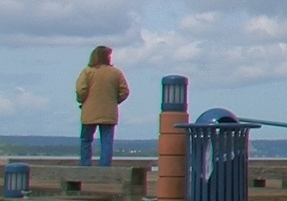 But it _is_ chromatic aberration. The red and green are clearly divergerging in the images. Look at the sail in the bottom of the three thumbnails and the trees in the image above. This is straight forward CA and bucket loads of it. Its worth saying that when zoomed in slightly the CA issues fall off and in the lens' sweet spot the images from the H1 are simply stunning. I am hoping that Canon have optimised the XH lens further and have reduced the CA or loaded the CA on the extreme of the telephoto range rather than the wide angle. If we accept that it is CA in the clips from H1, can we redirect our observations back to Kaku's G1 clips? CA in the H1 has been discussed many times in the H1 forums, speculating and posting pictures about it here isn't germaine. I don't think that we can accept that it is CA in the clips from H1, but thanks Tom, you are quite right that this subject is far off the topic of this particular thread -- which is supposed to be feedback regarding what Kaku has provided for us so far. I think it's an important subject on its on that deserves to stand as a separate thread, so I might pull these replies out and set them apart as a separate topic. Suffice to say that there is obviously some apparenht confusion here about what does or does not constitute chromatic abberation and what does or does not constitute chromatic abberation the chroma subsampling effect. Showing frame blow-ups of HDV recorded to a DV cassette is one thing. 4:2:2 SDI output is something else entirely, as is the camera's still photo mode processed in a non-video color space by the DIGIC DSP. A conclusive determination can be made only by examining identical material from *all* of the available output options provided by the camera. Kaku my friend... show us some nice scenery at daylight!